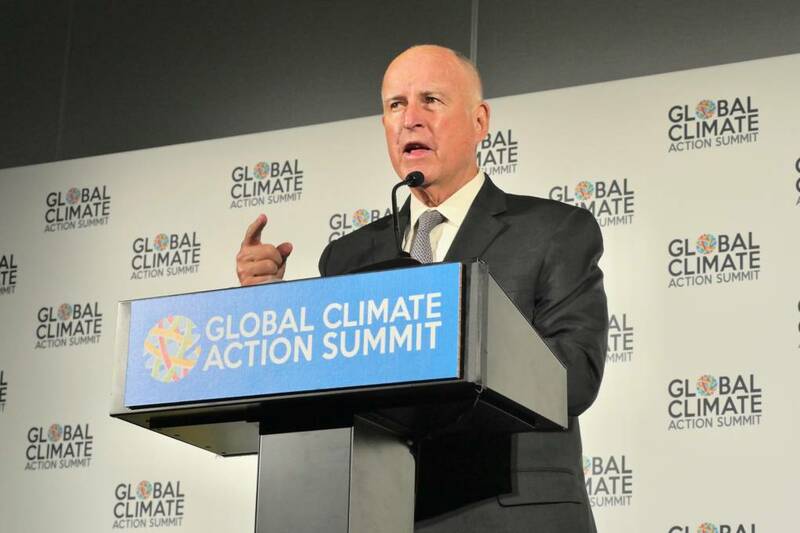 When President Trump announced last year that he was pulling the U.S. out of the Paris climate deal, governors and mayors around the country resisted and promised to continue their efforts to slow global warming. Today, many of those lawmakers are convening with business leaders, subnational governments, and NGOs for the much-anticipated Global Climate Action Summit, a conference where participants are showcasing the progress they've made and strategies for taking further action on climate change. The conference, which runs from Sept. 12-14, will help lay the groundwork for 2020, when global leaders will once again meet to pledge deeper cuts of greenhouse gas emissions. KQED Science will be following the summit closely so be sure to check our page for the latest updates. Governor Jerry Brown is closing the conference, announcing that California will launch its "own damn satellite" to track pollution. California is working with San Francisco-based Earth imaging company Planet Labs to develop the satellite. “With science still under attack—we’re under attack by a lot of people, including Donald Trump—and with the climate threat growing, we’re going to launch a satellite—our own damn satellite to figure out where the pollution is and how we’re going to end it." Planet, founded by ex-NASA scientists, operates the world’s largest network of satellites. The idea seems to be to catch major polluters red-handed, naming and shaming them. A Big Brother for good? A representative for ING just announced that the banking institution is steering its lending portfolio towards keeping the global temperature rise to "well below two degrees Celsius," in support of the Paris agreement. "This makes us the first bank to commit to science-based climate scenarios in our business strategy," she says, adding, "We will do this with pioneering science-based methodology." Now taking the stage is Carlos Manuel Rodriguez, Costa Rica's Minister of Environment and Energy. The country is striving to become the first carbon-neutral nation by 2021. Rodriguez says that Costa Rica is working on a massive decarbonization plan that will impact several economic sectors. Costa Rica, which abolished its army in 1948, amended its constitution in 1994 to include a right to a healthy environment for its citizens. Today, the tiny Central American country gets nearly all of its electricity from renewable sources, with 80 percent coming from hydropower. Vox reports that Costa Rica can power itself for months at a time relying solely on renewables, running for a record 300 days on clean energy in 2017. Now speaking, New York City Mayor Bill de Blasio, who just announced that New York City will invest two percent of its pension assets, or $4 billion dollars, in climate solutions. "The signs couldn't be clearer, we could lose our planet." He notes that in January, NYC became the first city to begin divesting its pension assets from fossil fuels. Mayor Bill de Blasio: "We will act when nations fail, including our own." Internationally acclaimed primatologist and anthropologist Dr. Jane Goodall is discussing the importance of protecting rainforests. Goodall stars in the new NatGeo documentary "Jane," which has been nominated for seven Emmy awards. A start-up from Stanford University won the California Climate Cup. The competition received more than 100 submissions for different climate-focused business plans. Solstice Energy Solutions took home the prize. The company uses big data to analyze energy use, coordinating different energy sources like solar and energy storage. A representative for a new initiative called “Lawyers for a Sustainable Economy” is speaking. Nine top law firms recently launched the project, which will offer pro-bono legal support to entrepreneurs and community-based non-profits to help advance their work in key climate and sustainability issues. The firms have pledged to commit approximately $15 million of funding by 2020. Facilitated by Stanford Law School and Stanford’s Precourt Institute for Energy, the program will connect participating law firms with potential clients. Speaking after Garcetti is Pasquale Romano, president & CEO of ChargePoint, operator of one of the world’s largest charging station networks for electric vehicles. Romano says that his company is planning a near 50-fold increase in its global network of charging spots by 2025. Romano: "The electrification taking place today is as fundamental as the internal combustion engine was." The company is planning to add 2.5 million loading stations to its network. Romano says the world of mobility is on the "cusp of a generational change." Now taking the stage is Los Angeles Mayor Eric Garcetti. Los Angeles plans to build 15 new transit lines for the upcoming 2028 Olympics. Garcetti says the city is pledging to buy only zero emission buses by 2025 in the lead up to the Olympics. Garcetti: "The demand for 80,000 buses is a power signal to the marketplace." Al Gore is on the main stage, discussing the impact of warming oceans. Al Gore: "Every night on the nightly news is like a nature hike through the Book of Revelations, and we've got to connect the dots between the cause and the effect." "We are putting so much heat into the oceans. We're using the sky as an open sewer. This is literally insane." Gore says more than 90 percent of heat goes into the oceans. The cumulative amount of trapping that much heat energy is equal to "400,000 Hiroshima A-bombs, going off every single day." "That's why the temperatures are going up every year. Thousands of high-temperature records have been broken this year." Gore goes on to say that the Paris agreement "has pointed the way to a world that is united in taking action. All 195 nations of the world are committed." "And yes, I know, Donald Trump made a speech and most of you know that under the law--and we are still in the United States, a nation under law as of right now and will continue to be-- and under the law, the first day the US could legally withdraw, is the first day after the next presidential election." "And by the way, if there is a new president--excuse me for a moment [laughter]--then, a new president could simply give 30 days notice and we're right back in the Paris agreement [applause]." "For anyone who doubts that we, as human beings have the political will to meet our obligations that history is demanding of us, just remember that political will is itself a renewable resource." The day kicks off with a discussion of oceans. John Kerry speaks on the main stage. In a breakout session, a discussion of the role of gender equality in environmental justice. That wraps up today's coverage of GCAS. Check out our live blog tomorrow for updates on the third day of the summit. A special video appearance by former President Barack Obama. "The Paris agreement was never going to solve the climate crisis on its own. That's up to all of us," he says. 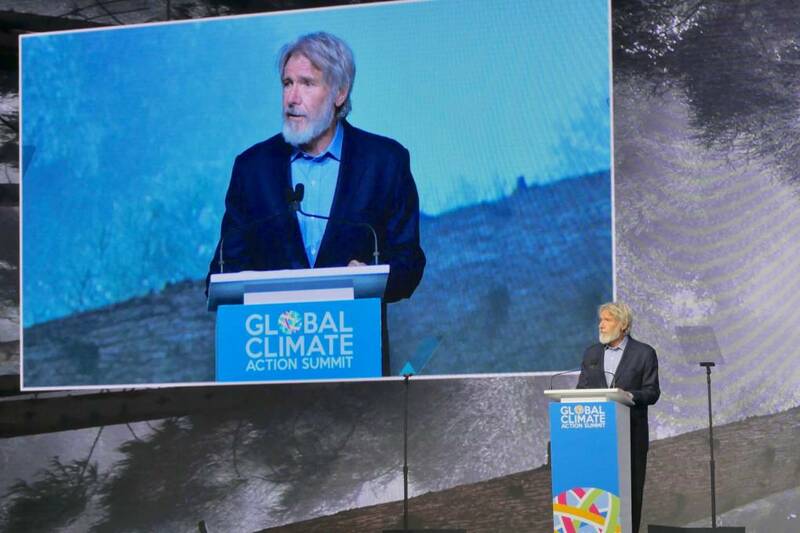 Actor Harrison Ford makes an impassioned speech about protecting the environment from climate change. "Stop for God’s sake denigrating science [crowd applauds]. Don’t give power to people who don’t believe in science. They know who they are and we know who they are." Ford goes on, "So long as the Amazon rainforest is slashed, burned, protected lands of indigenous people is encroached, wetlands are destroyed, climate goals will be out of reach and we will be s*** out of time." "We need nature now more than ever, nature doesn’t need people. So let’s kick this monsters a**." AFL-CIO President Richard Trumka takes the stage. Houston Mayor Sylvester Turner replies to moderator Van Jones' question about what the "mayor of the energy capital of the world" is doing about climate change. "You can be the energy capital and recognize the need to do a lot to address climate change for our future," says Turner. "The mayor of Houston believes climate change is real [crowd applauds]. We believe in the Paris climate agreement...over 400 mayors have agreed to fulfill the tenets of Paris...if you don’t lead from the top, mayors will lead from where we are." He also touted Houston’s investments in clean energy and said the city gets 80 percent of its power from wind and ten percent from solar, saving the city 40 million dollars over the next 20 years. 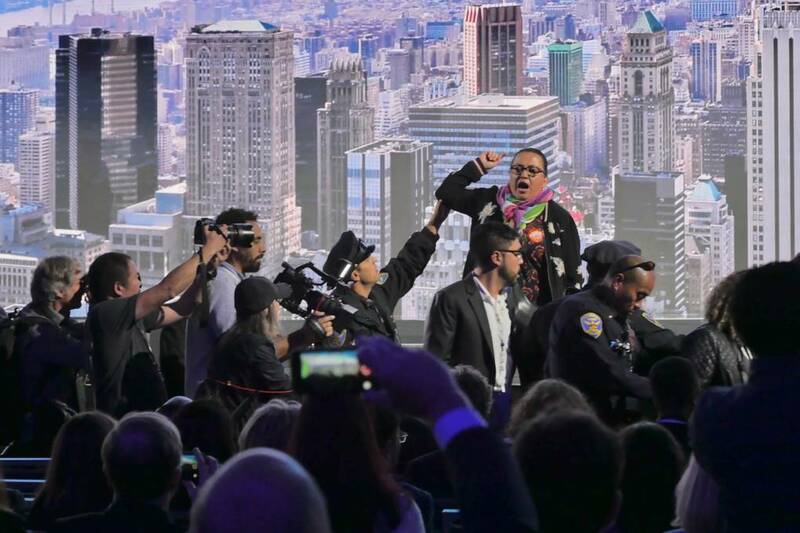 Protesters interrupt the event, chanting "Mother Earth is not for sale!" 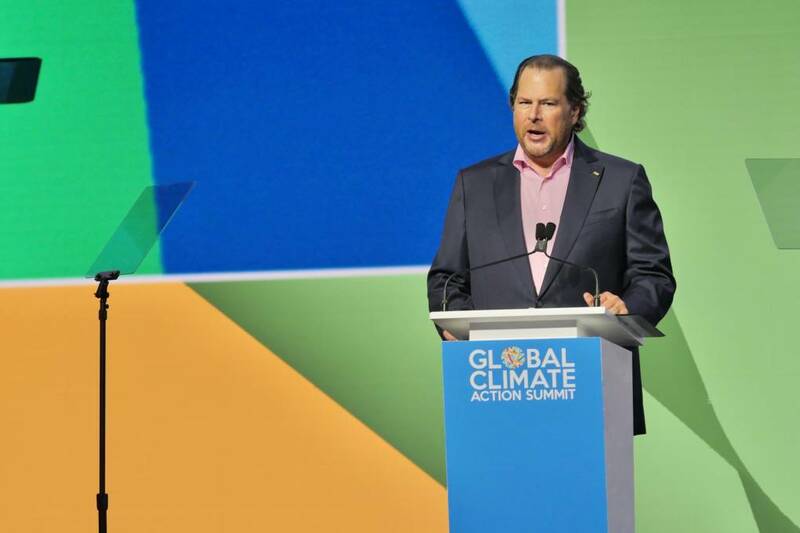 Salesforce's Marc Benioff announced the company will reach 100 percent renewable energy by 2022. “I challenge CEOs to take action on climate” which he said gives companies like his “a competitive advantage” because more and more customers especially young ones expect it. “This is a make-or-break moment. This is why we are here and this is why we must do more. We must act and we must act now," he says. Kevin Johnson, chief executive officer at Starbucks, speaking as part of a panel with NJ Governor Murphy and others. “The pursuit of profit does not have to be in conflict with the pursuit of doing good," he says. In 2018, there was a 39 percent rise in companies committing to align themselves with the Paris agreement, according to Science Based Targets, a group that seeks to guide companies in reducing their greenhouse gas emissions. New Jersey Governor Philip Dunton Murphy speaking. In May, Murphy signed an executive order directing the state's the Board of Public Utilities to put together a plan to achieve 100 percent clean energy by 2050. "I don't want to face my children someday when they ask me 'Why didn't you do anything?'" --Paris Mayor Anne Hidalgo. "There's never been so much reason to be nervous, but there's never been so much reason to be hopeful," - Johan Rockström, executive director of the Stockholm Resilience Center and professor of environmental science at Stockholm University. Rockström is best known for his 2009 proposal identifying specific limits to Earth’s various systems. He called these limits planetary boundaries and warned that should we exceed them, we may no longer enjoy the life-sustaining balance between nature and human progress. 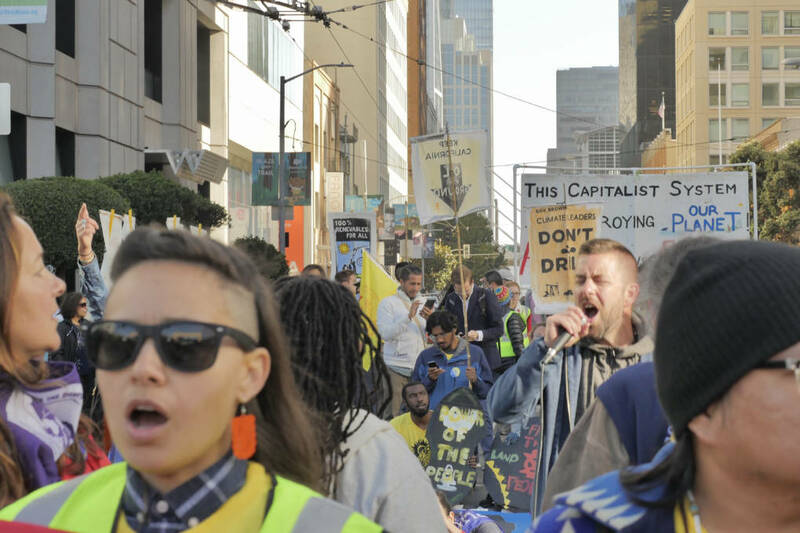 A reporter asks Governor Brown to comment on the protests outside the Moscone Center, where he is speaking. The demonstrators are protesting continued drilling in California, a contentious flashpoint between many environmental activists and Brown's administration. Brown: "There is no one off here. There's no one thing ... California, with the leadership of our Air Resources Board, has released a plan ... the plan is an integrated plan built up overtime ... and we welcome any suggestions people have. But I believe California has the most far reaching plan to deal with emissions ... as well as oil... we have the actual method of getting there ... but make no doubt about it, there is no place in the world that has a more integrated, comprehensive plan to reduce emissions from all sources." Governor Jerry Brown had some salty words for President Donald Trump at a press conference with Michael Bloomberg this morning. "It borders not only on insanity but criminality. The only way we’re going to get global warming under control is the reduce the big pollutants." He singled out Trump's recent moves to scale back California's CAFE standards and the latest announcement to roll back Obama-era methane emission rules. Brown pointed out that the most potent "short-term" pollutants, such as methane, black carbon and HFCs, are must-solve problems. "Liar? Criminal? Fool? Pick your choice," said Brown, when asked how he thinks Trump will be remembered. "We have market forces at our back and we have the public at our side, so I ike our chances," said Bloomberg. KQED Science reporter Craig Miller writes that the report "projects that despite a retreat by the federal government, a serious push from the bottom-up could put the U.S. within reach of its Paris emissions goals by 2025."